1-605-666-4483 320 Old Cemetery Rd. If you're looking for a place to stay in the beautiful Black Hills of South Dakota, we have just the thing. Let us help you find a place to stay that hold views of Mount Rushmore and are close to dining and shopping locations. All of our hotels are centrally located in the Hills – just minutes from Mt. 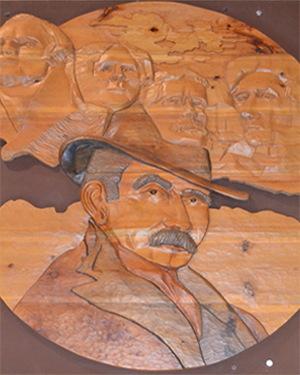 Rushmore and other major Black Hills attractions. Daytrips are our specialty and we give you the perfect place to come back to after a full day of exploring all the area has to offer. We have many facilities to choose from, here in Keystone, SD – with all the amenities you want including pools, conference rooms, family suites, and much more. Whether you're looking for large, family suites, or quaint theme rooms - one of our hotels will be able to accommodate. From spectacular views to comfortable rooms – rest assured that your stay with a Rushmore Reservations hotel will be enjoyable. The Keystone Boardwalk Inn & Suites welcomes you to the heart of Keystone and the Black Hills! Being located on the boardwalk gives you flexibility and places you right next to local shops, the 1880 Train, Borglum Museum and fabulous dining. While you’re here, be sure to visit all the quaint shops and many restaurants all with in walking distance of the motel. Mount Rushmore is located two miles away, making Keystone the closest town to the national monument. We are also just minutes away from Custer State Park, Mount Rushmore Cave, and Wind Cave. After you have spent your day traveling and exploring the scenic Hills, let our professional and friendly staff assist you in finding the clean and comfortable room that will fit you and/or your family's needs. Sit back and flick through the TV channels while you relax after your day. Then, join us in the morning for our complimentary continental breakfast. Wake up to views of Mount Rushmore! Magnuson Grand offers quaint lodging with theme rooms, hand-crafted log furniture, in room Starbucks coffee, on-site fine dining and easy walking distance to area attractions and shopping in Keystone, SD. Free local & 800 calls. The Super 8 Motel welcomes you to Keystone, SD in the beautiful Black Hills. 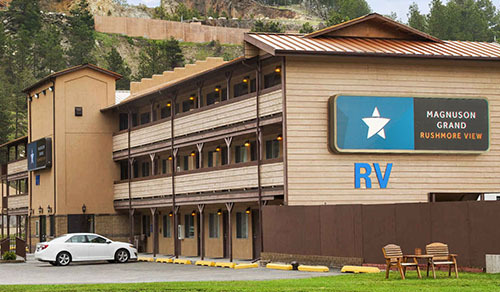 With our location just 1.5 miles away from Mount Rushmore, you will be in the perfect spot to see the faces. Explore the town’s quaint shops and many restaurants, all in walking distance of the motel. Keep your adventure going and explore the 1880 Train, Borglum Museum, Custer State Park, Mount Rushmore Cave, and Wind Cave – all minutes away from the motel. Let our professional and friendly staff assist you in finding a clean and comfortable room that will fit your needs. Enjoy basic cable TV, and join us in the morning for our complimentary SuperStart continental breakfast. Awesome, affordable, large family suites. Spacious rooms, handmade hickory furniture, pillow top beds. Indoor pool, whirlpool, exercise room. Wireless Internet. Suites w/ fireplace & Jacuzzi suites. Meeting room. Walking distance to dining & shopping.